Moring Sun Red Guard clips During the Cultural Revolution, the film industry was severely restricted. Most previous films were banned, and only a few new ones were produced. In the years immediately following the Cultural Revolution, the film industry again flourished as a medium of popular entertainment. Domestically produced films played to large audiences, and tickets for foreign film festivals sold quickly. Chris Berry, a professor of film and television studies at Goldsmiths University of London who organized a Cultural Revolution film series, told dGenerate films, some of the most interesting Cultural Revolution films capture a “the visceral thrill of political action, including violence, and how powerfully exciting this can be for young people, at the same time as it can make them vulnerable to being used and making mistakes. That’s why we chose Mao’s saying “A Single Spark Can Start a Prairie Fire” for the film series. We felt it captured the sense of excitement and danger perfectly. In the area of culture specifically, Paul Clark’s book, The Chinese Cultural Revolution: A History, has helped to explode all kinds of myths about the Cultural Revolution. Those include the idea that there were only 8 Model Works (yangbanxi) “there were more. And the idea that the films of those 8 Model Works were only movies that the 800 million Chinese had access to was wrong, too. There were older films that continued to circulate, numerous documentaries, new feature films after 1972, and a range of foreign films from countries like Romania, Albania, and North Korea. So, I already wanted to take another look by the time the idea for the series came up. Film was easy to control, compared say with poetry or even art. We know that people wrote underground novels and poems, copied them, and circulated them by hand. We know that some artists made watercolors on thin tissue paper, rolled them up, and hid them in a secret compartment of furniture. We even know that the Party had trouble establishing standardized and unchanging versions of the model works, and that was one of the reasons they wanted to film them “once their were filmed and the authorized version was clear to everyone, local troupes couldn’t make local changes! But there was no video, and not even any home movie cameras in China then, let alone the internet. I suppose the closest thing to what you’re asking about was so called “internal” (neibu) screenings of banned works and foreign works that were not released to the general public. In theory, these were to inform trusted central figures of what to be on guard against. But tickets to internal screenings were highly sought after, and not always for those reasons! I believe that Madame Mao (Jiang Qing) was a huge fan of The Sound of Music. You can get some sense of its power when you watch something like the ballet version of The Red Detachment of Women. Forget delicate swans fluttering tragically to the floor. This is girls with guns and grenades, but still en pointe. The militant requirements of the revolutionary aesthetic led to a complete reworking of traditional ballet. The romantic couple is irrelevant and the pas de deux more or less disappears. In its place comes a range of breathtaking leaps and aggressive thrusts, all coordinated by the corps de ballet. Seeing the main character poised above the cowering landlord, her bayonet held over him, is such a contrast to anything you’ll find in traditional ballet! It makes the hairs on the back of your neck stand up “for all kinds of reasons. And the whole work is amazingly kinetic and energetic. The East Is Red On power represented in Cultural Revolution films, Berry said: “For me, something that gave me a jolt when watching the model works again was the strong and positive emphasis on class hatred. All that energy was very exciting, but I was brought up short every time the films hammered home the need to mobilize class hatred. I couldn’t help wondering about what it was like to be on the receiving end of that hatred. I wonder whether anyone had similar worries at the time, or is my thinking that way more the result of all the post-Cultural Revolution films that present it from the perspective of the victims of class struggle? As you might expect with a movement that placed such emphasis on identifying and eliminating the enemy as a way of unifying “the masses” with their leaders, the Cultural Revolution is very starkly polarized. Characters are either good or bad. The aesthetic theory of the “Three Prominences” (san tuchu) articulated this: among the characters, the positives ones should be prominent; among the positive ones, the heroes; and among the heroes, the main hero should be most prominent. Bad guys were lit poorly, decentered in the frame, skulking, and looked down on, whereas heroes were bright, shining, in the centre, and shot from below, often gazing into the middle distance. In the documentaries from the time, Chairman Mao gets the close-ups! However, one thing that has to be said about that is I don’t think it always worked. In theory, the most positive character is supposed to be the most interesting, but I don’t think that someone who is so uniformly knowledgeable and good draws our attention. In The Red Detachment of Women, for example, it’s the male detachment leader who is the main hero. But I can’t even remember his name right now. The one who everyone loves is Qionghua, the former slave girl who has to learn to submit to revolutionary discipline rather than pursue personal revenge. I’m sure if you asked most people who the main character was, they’d say her. Dongfang Hong (“The East Is Red”) by Wang Bing, China (1965): Released immediately before the Cultural Revolution, this song and dance epic soon became one of its iconic works, and the title song became its anthem. One of the main elements of the Cultural Revolution was the Chairman Mao. People carried the Little Red Book with them everywhere, and reported on their day to pictures of Mao on the wall when they came home in the evening. Mao was the red, red sun, and his followers were the sunflowers that turned towards him. This reverent work follows the history of the Revolution from the founding of the Communist Party of China in 1921 through to the 1949 Liberation, in glowing Chinese. Hongse Niangzijun (“The Red Detachment of Women”) by Pan Wenzhang, Fu Jie (1970): This 1970 film is a ballet, but forget about frail women in tutus fluttering to their tragic and beautiful deaths. Red Detachment of Women is still en pointe. But otherwise it is all clenched fists, righteous anger, and bayonets at the ready! Freed by the Communists from imprisonment by the local landlord, Wu Qionghua seeks vengeance. In this story of women’s liberation and empowerment, Mao-style, she also learns about revolutionary discipline. The film provides some of the most powerful iconography to come out of the Cultural Revolution. In their uniforms with short pants, the ballerinas were also the pin-up girls of the Mao era. Zhiqu Weihushan (“Taking Tiger Mountain by Strategy”) by Xie Tieli (1970): Before it was the title of Brian Eno’s second album, released in 1974, Taking Tiger Mountain by Strategy was one of the most popular revolutionary operas. Like many other young Westerners, Eno was inspired by the idea of the Cultural Revolution. He picked the name after seeing a book of postcards showing key scenes from the film. The story is based on a true event from 1946, when a Communist reconnaissance team member disguised himself as a bandit in order to infiltrate their stronghold. Full of bold leaps and martial arts-style action, the film is a thrilling and kinetic action movie as well as a propaganda film. The newsreels of the time present a powerful and vibrant record of the political culture of the time, with its mass rallies, criticism sessions, and parades. Mr. Liu will present and discuss some of these materials. During the Cultural Revolution, great emphasis was put not only on class struggle but also on technological progress and national self-reliance. The model 'commune' of Dazhai and the industrial model at Daqing were promoted in documentaries. These themselves were shown all over the country by mobile projection teams on a special super-8 style 8.75mm film stock developed for the purpose. Mr. Liu plans to bring his 8.75mm projector to Vienna to show us, along with some documentaries. Kunao Ren De Xiao (“Troubled Laughter”) by Deng Yimin, Yang Yanjin (1979): Immediately after the Cultural Revolution in 1976, a cycle of ‘scar films’ helped the Chinese public come to terms with the “decade of chaos.” Most were high melodrama. But, full of dream sequences and luridly coloured fantasies, Troubled Laughter is a rare absurdist comedy. In 1975, reporter Fu Bin returns to work after political re-education. But he finds himself caught between the desire to write the truth and the deluded politics of the final days of the Cultural Revolution. Even his wife advises him to lie, but in the end he is arrested again. A final coda promises release and family reunion. But it is shot as a fantasy sequence, suggesting it may not be for real. Troubled Laughter was selected for screening outside competition at Cannes in 1981. Carma Hinton was born in Beijing in 1949, the same year as founding of the People’s Republic of China. The child of dedicated American revolutionaries, today she works in the United States as a documentary filmmaker. Morning Sun takes her back to Beijing to interview her friends about their time as Red Guards. Combined with rare archival footage, it conjures up the excitement and psychology of the times. Where Auch wenn ich nicht mehr bin focuses on the victims, Morning Sun examines the perpetrators -- or were they victims, too? In Yang Ban Xi: the Eight Model Works the Cultural Revolution is over but the eight model revolutionary works commissioned by Madame Mao--- vivid hybrids of Beijing opera, ballet, and symphonic music---live on. Yan Ting Yuen’s documentary explores their origins and form, and their ongoing appeal to young Chinese such as rock musician Zhao Wei. She also follows the now middle-aged original prima ballerina of The Red Detachment of Women, Xue Qinghua, as she reprises the role of a lifetime to rapturous applause. Lan Fengzheng (“The Blue Kite”) by Tian Zhuangzhuang (1993): Tian Zhuangzhuang was punished for Blue Kite by being banned from directing films for 5 years. At the same time charming and chilling, the film follows the childhood of Tietou as he grows up with his mother, through three political movements: the Anti-Rightist Movement (1957), the Great Leap Forward (1959-1960), and the Cultural Revolution (1966-1976). Each movement brings a new father figure into their lives---and takes him away. The official line is that the Cultural Revolution was an aberration in China’s otherwise glorious socialist history. Blue Kite suggests otherwise. It is, of course, banned in China. Wo Sui Si Qu (“Though I Am Gone”) by Hu Jie (2006): Bian Zhongyun was the respected principal of a girls’ high school in Beijing -- until her own students beat her to death in August 1966, as the Cultural Revolution reached fever pitch. What would you do if you heard your wife was dying in the ER? Bian’s husband, Wang Qingyao, grabbed his camera. Hu Jie’s remarkable film is not only about the events of that terrible summer when Mao instructed students to “be violent.” It is also a contemplation of the drive to witness and document---to never forget. No one has ever been charged with Bian’s murder. And, for Wang Qingyao, it is just like yesterday. Readymade by Zhang Bingjian (2008); How would you feel if your wife looked like Chairman Mao? Unsurprisingly, the cloud on the horizon of Chen Yan’s new career as a female Mao impersonator is her husband’s discomfort. 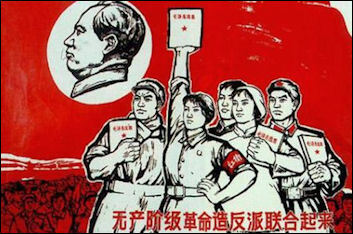 The Mao cult was a major feature of the Cultural Revolution. And although, like Elvis, Mao has long ago left the building, he lives on in the form of Mao impersonators. Zhang Bingjian’s documentary shows just how far two of the many Mao impersonators are willing to go in their efforts to make their careers. Significantly, both of them are old enough to remember the Cultural Revolution Mao cult. Yangguang Canlan De Rizi (“In the Heat of the Sun”) by Jiang Wen (1994); For many people, the Cultural Revolution was a disastrous “decade of chaos.” But In the Heat of the Sun focuses on those too young to be either victims or Red Guards. Left behind after their parents had been sent down to the countryside to be punished and the schools had all closed, Beijing’s teenagers came of age in an atmosphere of unrestrained and sometimes cruel freedom. The film is the debut of Jiang Wen, who was known before as a lead actor (for example in Zhang Yimou’s Red Sorghum), and has since made films like Devils on the Doorstep (2000) and Let the Bullets Fly (2010). It was adapted from a novel by the “hooligan” author, Wang Shuo. Though I Am Gone Chris Berry, a professor of film and television studies at Goldsmiths University of London, told dGenerate films, “Recent films such as Hu Jie’s Though I am Gone , Searching for Lin Zhao’s Soul , and The East Wind State Farm look back at the Cultural Revolution through a present-day lens. On comparing these with films made in the Cultural Revolution, Berry said, The recent films are independent documentaries, whereas the films from the post-Cultural Revolution era were melodramas, for the most part, and made within the state-owned studio system of the time. The contemporary films are oral histories that are often a last chance for older people to give their testimonies. The government’s line is that the Cultural Revolution has been declared a mistake and dealt with, so there’s no need to make any more films about it. So, I don’t suppose these current documentaries are very welcome, to put it mildly. In fact, I think they are incendiary and I’m not surprised that many of the filmmakers are keeping relatively quiet about them. On the other hand, I think that most of the post-Cultural Revolution melodramas were part of a process of trying to rebuild trust between the government and the people on the grounds of a shared suffering “Deng Xiaoping suffered during the Cultural Revolution, just as so many ordinary Chinese did. It’s always struck me how the Chinese government and people were ready to go back and make films and write novels about the Cultural Revolution so quickly after it was over. It took the Soviets decades to begin to go into the Stalin era, and the Germans were not really ready to start confronting the legacy of fascism so quickly, either. But that’s where Wang Hui’s point comes in. Repudiating the Cultural Revolution and constructing a very straightforward image of the Cultural Revolution re-legitimized the Party.